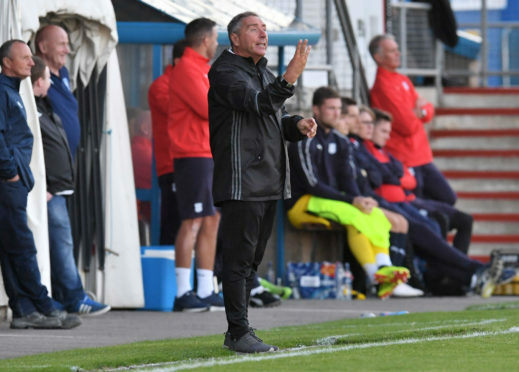 Jim McInally's Peterhead are in the sights of title-chasing Clyde. Clyde have geared up for a promotion push with the signings of midfielders John Rankin and Mark Lamont this summer, while last season’s top scorer David Goodwillie has remained at Broadwood. They have won their opening two league games but were beaten 4-1 by Hamilton Accies’ colts in midweek, when Peterhead came from behind to dump out League 1’s Brechin City in the Irn-Bru Cup. McInally used to go watch Clyde games as a youngster and knows the demands of the fanbase in Cumbernauld. He said: “The way it’s going just now, I think they see us as their main rivals. Looking at the tips by some of the journalists at the start of the season, they had Clyde to do it. They’ve got players like David Goodwillie and John Ranking, so they’ll think they’re a big club in their own right. “I know their fanbase pretty well and they’ve maintained a lot of that support that think they’re a bigger club than League 2. There’s expectation that comes with that. “It would be foolish to dismiss any other teams, like Stirling Albion, at this stage. There’s quite a few improved teams in this league this year. At this stage, we’re still to get two defenders back in the team, so we’re making our centre-backs are learning. We’ve got two wingers playing at full-back. The Blue Toon are without Paddy Boyle and Mick Dunlop for the game at Balmoor but the pair are close to making their returns.